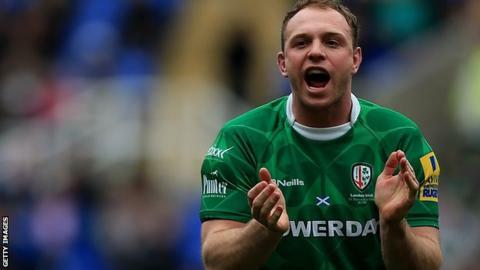 London Irish fly-half Greig Tonks says being thrust into a Premiership relegation battle does not faze him. Scotland international Tonks, 26, joined the Exiles last month from Edinburgh in a bid to help them climb away from the bottom of the table. And he kicked 13 points in the crucial 23-18 victory against Gloucester on Sunday to boost their survival hopes. "I'm enjoying being part of the club and set up, but obviously I've arrived at a tough time," he told BBC Sport. Tonks, whose last international appearance came against Italy in August, has signed a deal with Irish until the end of the season. The former Leicester and Northampton player hopes a regular run of appearances in the number 10 shirt will not only guide London Irish to safety, but put him in the frame for a Scotland recall. "I'm enjoying getting a run of games and having a real shot at fly-half," he said. "The Scotland coaches have told me if I'm playing well regularly, it doesn't matter if it's in Scotland, England or anywhere. "I enjoy having a strong input in how we play the game. Hopefully, I can pass that on to my team-mates and implement the way the coaches want us to play the game."